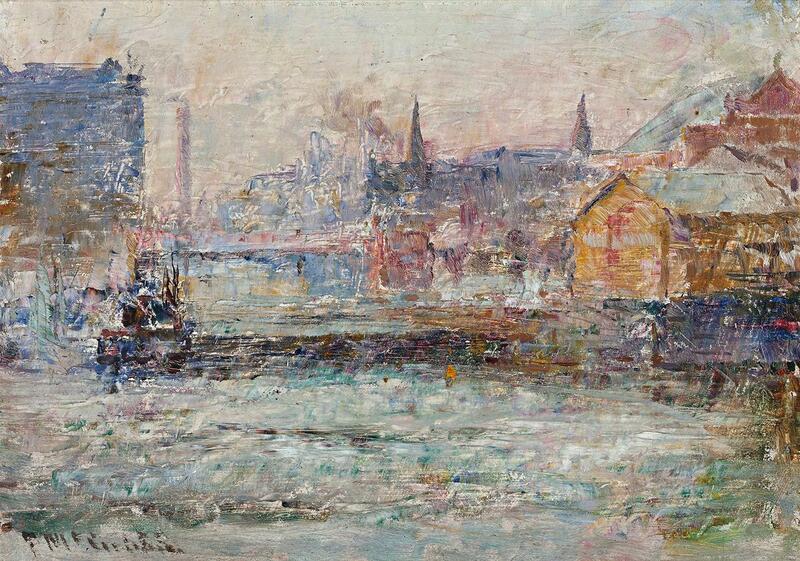 The docklands of the Yarra River fascinated Frederick McCubbin throughout his life. Born in west Melbourne, not far from the docks, he grew to know them well when on his bread rounds for the McCubbin bakery. From an early age he was drawn to scenes of shipping, surrounded by the life of the growing city. One of his earliest paintings, View of the New Dock, 1880 was shown in the Tenth Exhibition of the Victorian Academy of Arts, Melbourne, the ships and their tall masts evoking, for the young artist, tales of adventure and the romance of faraway places. A few years later, in 1887, McCubbin painted The City’s Toil, a shipping scene at Smith’s Wharf on the Yarra where funnels and masts compete. This was followed by Melbourne 1888, a large painting now surviving in two parts, one half being in the National Gallery of Victoria. McCubbin’s single trip abroad to London in 1907 provided many opportunities, realised in such paintings as At Colombo, c.1907, The Pool of London, 1907, and View of Naples, 1908. Then came Williamstown and its abundance of maritime life, inspiring such works as Harmony in Blue, Williamstown, c.1909, and the masterly Williamstown, 1915, once in the collection of the Traill family. During these later years, McCubbin made plentiful use of Winsor and Newton ‘oil sketching tablets’ to create lively scenes of Melbourne, the city and its docklands. Although small in size and broad in handling, their very quality commands the status of paintings rather than sketches. Painted to capture the moment in all its transient, atmospheric beauty, McCubbin’s later style grew richer in colour as it became more impressionistic. In Shipping on the Yarra, c.1910 and Little Dock, Yarra River, Melbourne, c.1910 McCubbin returned to South Wharf and the docklands with the city’s buildings rising in the background.1 The city itself, of busy trams and people, is the focus of his imaginative attention in Princes Bridge, 1910. And several brilliant views of Collins Street, c.1915 are in the collections of the National Gallery of Victoria, Geelong Gallery and a private collection.2 Like the late works of J. M. W. Turner, whom he admired greatly, these paintings transcend technique through their unrivalled freedom of touch, creating images of ineffable beauty. Little Dock, Melbourne, c.1914 belongs to these late gems, sparkling with light and colour. Writing to his friend Tom Roberts, in January of 1909, McCubbin said he had been down to Williamstown making a few sketches: ‘…just like Venice, lovely colour. Water, sky and an old ship … the older I get the wider my interest grows in all life, colour, charm … in our past work we have been too timid.’3 Timidity now banished, McCubbin painted Little Dock, Melbourne with such freedom and boldness of technique that it eclipses figuration, touching on abstraction. The enthralling freshness and immediacy of Little Dock, Melbourne comes from the way in which it was realised – painted in the open air with rapid strokes of knife and brush directly from the motif. The broad strokes of colour suggest that most were applied with the palette knife, so favoured in his later works. High-keyed and cool touches of colour add a jewel like quality, McCubbin’s favoured atmosphere of late afternoon heralding twilight with golden colours among the growing shades of mauve and blue.